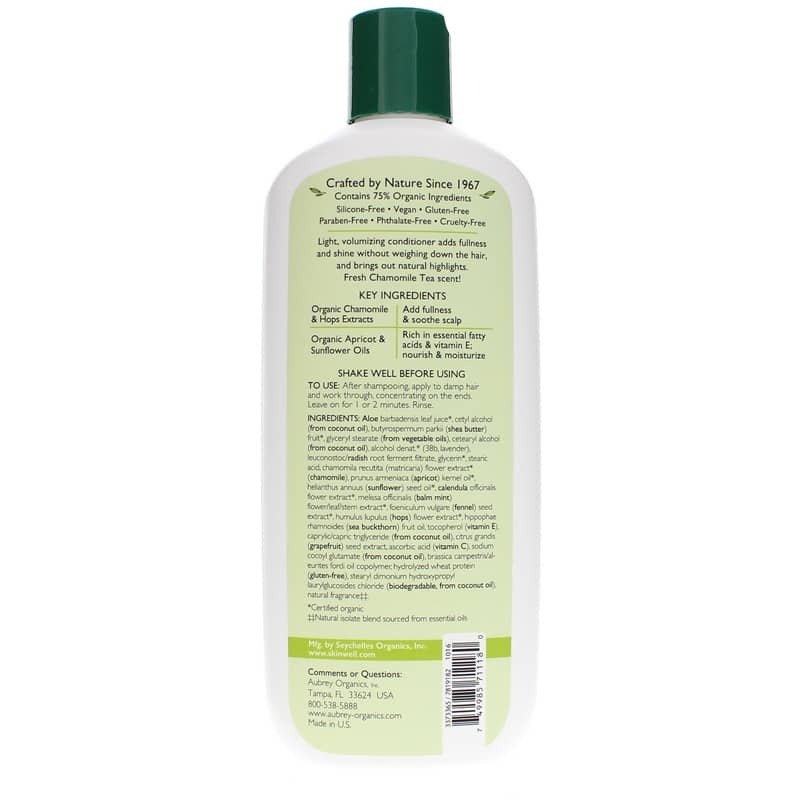 Chamomile Luxurious Volumizing Conditioner is a great choice for bouncy hair and brilliant shine! 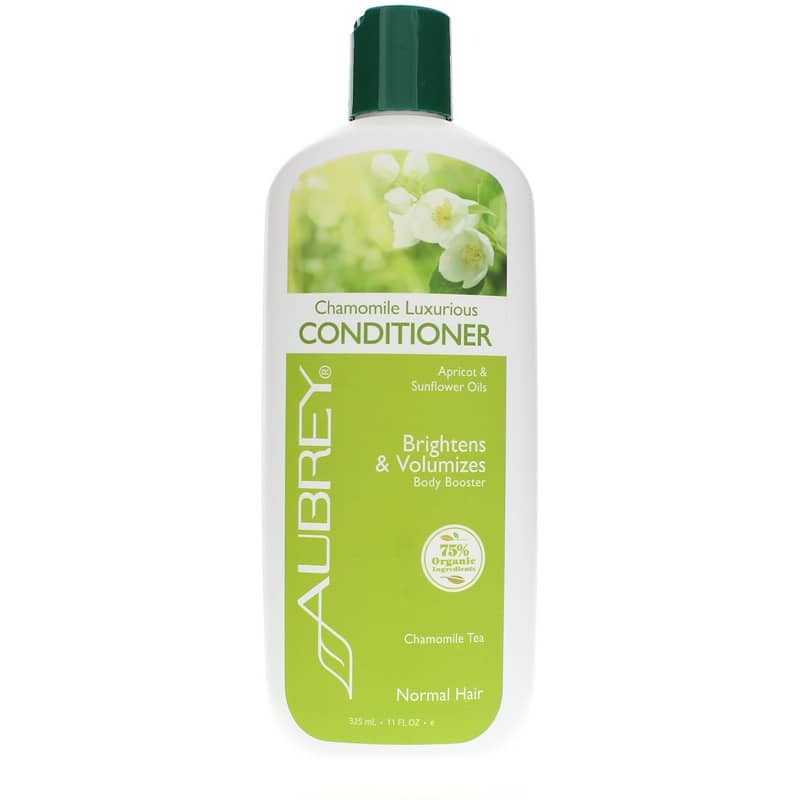 This lightweight, lightly fragrant, volumizing conditioner adds body and manageability to your hair without weighing it down. This great product contains thickening B-vitamins to give your hair volume, while golden Roman camomile enhances natural highlights, and soothing herbal extracts condition and add shine. Aloe barbadensis leaf juice*, aqua, cetyl alcohol (from coconut oil), butyrospermum parkii (shea butter) fruit*, glyceryl stearate (from vegetable oils), cetearyl alcohol (from coconut oil), alcohol denat. * (38b, lavender), leuconstoc/radish root ferment filtrate, glycerin*, stearic acid, chamomilla recutita (matricaria) flower extract* (chamomile), prunus armeniaca (apricot) kernel oil*, helianthus annuus (sunflower) seed oil*, calendula officinalis flower extract*, melissa officinalis (balm mint) flower/leaf/stem extract*, foeniculum vulgare (fennel) seed extract*, humulus lupulus (hops) flower extract*, hippophae rhamnoides (sea buckthorn) fruit oil, tocopherol (vitamin E), caprylic/capric triglyceride (from coconut oil), citrus grandis (grapefruit) seed extract, ascorbic acid (vitamin C), sodium cocoyl glutamate (from coconut oil), brassica campestris/aleurites fordi oil copolymer, hydrolyzed wheat protein (gluten-free), stearyl dimonium hydroxypropyl laurylglucosides chloride (biodegradable, from coconut oil), natural fragrance**. Shake well before using. After shampooing, apply to damp hair and work through concentrating on the ends. Leave on for 1 or 2 minutes. Rinse.